Born in Italy. Since she was little, she was interested in classic literature, languages and philosophy. 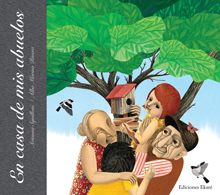 When she moved to Barcelona, she began to write children’s books. She works for Thule Ediciones and writes for some literary magazines. She’s the founder of Editorial A Buen Paso and she keeps creating books for children.